Golaem Crowd enables to retarget animation from one skeleton to another, which means a motion created from a skeleton A (let's say: a human) can be replayed on skeleton B (let's say: a biped with four arms). You will notice when describing a skeleton, or auto-computing one, that the limbs are grouped in channels (representing left/right arms, legs or head). Golaem Crowd stores and processes motions by channel, which means that in order to be able to retarget motions correctly, Golaem Crowd needs to know which channels from skeleton A match the channels on skeleton B. This is the role of the Motion Mapping. 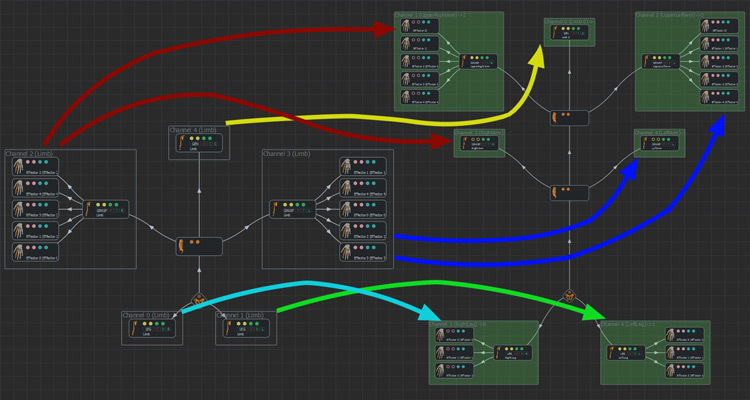 Note that if you intend to play the motion on the skeleton it was extracted from, you don't need to create a motion mapping, you just have to choose the Identity Motion mapping Mode in the Motion Behavior and Locomotion Behavior. Before creating a motion mapping, you need first to load the character on which your are going to retarget the motion (skeleton B), and a motion exported from skeleton A. 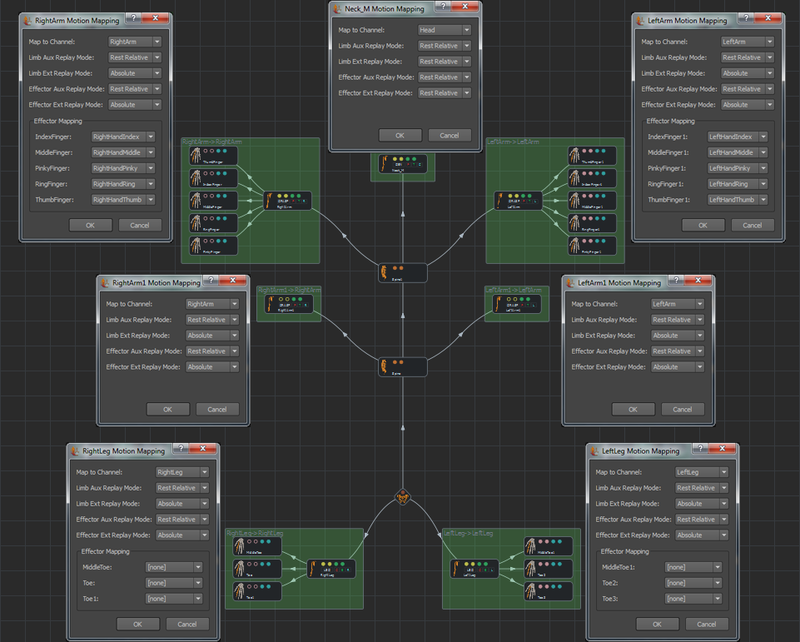 You can then compute the Motion Mapping automatically by pressing the Compute Motion Mapping button. 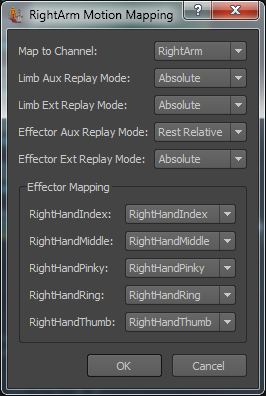 If you want to change the computed motion mapping, right click on a channel rectangle (but not on a limb) and select "Edit Motion Mapping", as explained in the Character Maker Main Workspace help. You can then edit the channel to which the right-clicked channel is mapped. To view the available channels of a given motion, you can load it in the Character Maker. 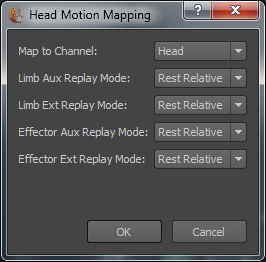 When editing the Motion Mapping of a human morphology, it is advised to set the Replay Mode of the head channel on Rest Relative for all (Limb/Effector, Auxiliary/Extension). 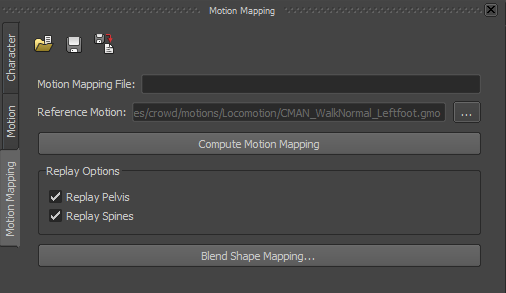 When saving the animation mapping file ( ), it is advised to name it using the following convention skeletonBname_replay_skeletonAname.gmm, for example, crowdman_replay_rocketbox, when mapping the crowdman skeleton to rocketbox motions.